I love seeing edible posies are gussied up on cakes and in salads! Your fairy cakes are just magical! Those fairy cakes with real flowers are stunning! I love a bit of tart rhubarb so I am sure they taste as good as they look. Wow these are so pretty! I don’t know if I would have the heart to eat them! And one recipe into five challenges, that has to be some sort of record!?! I’ve never quite got my head around eating flowers but they look so pretty – these are fairy cakes that actual fairies would eat! So so pretty! Almost seems a shame to eat them but then that would be a waste of good cake! What delicious flavours and those flowers are just so pretty! I’ve never eaten flowers I don’t think and these are so pretty that I’m not sure if I’d be able to! Isn’t it odd how some recipe seem to come away from the cases and some don’t – there never seems to be any logic to it, but taking them out is a great solution. What a celebration of spring here Choclette! I really love the colours, they look beautiful these fairy cakes. I am intrigued by edible flowers . I have seen many salads made with flowers too. I want to give it a go! What beautiful flowers, a real taste of spring. I do love borage flowers, I grew it for the first time last year and made use of them in drinks and salads and I am really hoping they have self seeded. I can’t see any sign yet though. I did try the leaves but really? I am not sure why they suggest that you should eat them, even when tiny the hairs are too much for me. My rhubarb is ready and it is crying out to be eaten. I must oblige today. Stunning little cakes, they really sing spring! Such pretty, perfect little Fairy Cakes! Too beautiful to eat…then again, rhubarb, rose and white chocolate? Ah, go on then! Thank you for entering them into TTT! 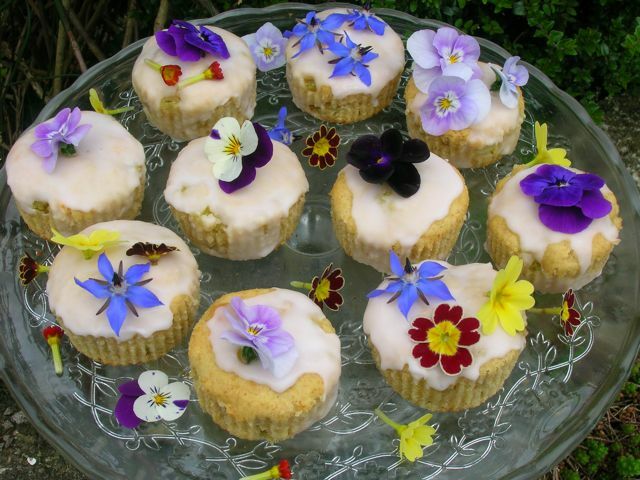 How lovely to be able to decorate these fairy cakes with edible flowers. I think they look so spring like and rhubarb does go so well with white chocolate. The sourness is balanced by the sweet of the chocolate. I do like your icing too, so much more delicate than a mouth full of buttercream!